Switching numbers quick and simple. Setting up payment was fine too and the bundles are great value. Great customer service team. "One of the Best PAYG Deals Around"
One of the best pay as you go sim's IMO. Runs off EE and gets me a great signal. Not the cheapest but the bundles are competitive. Would be great if they lowered the prices for national and international calling and added WiFi Calling like EE has. Unfairly high charges outside of their "bundle" pricing scheme. I racked up £30 in data charges over a 36 hour period! They have a convoluted payment structure that leaves the customer exposed to extortionately high prices in the case of honest oversight. An extremely cynical stance from their customer service - "That's just the way it works!" Avoid! Excellent 30 day pay as go bundles including data/texts/calls from. I've been with them 6 months and their PAYG options are more competitive than most other operators out there. Recommended. Great Company! They have good deals on SIM deals for payg customers like me. Recommended. "Good coverage from Asda Mobile"
Great service and excellent value. Asda's £5 30 day bundle is perfect for my needs. I get great customer service from them with a UK based call centre and they are always very helpful and friendly. Wouldn't hesitate to recommend. Asda runs on the EE network. I found the service to be excellent as good as EE on their own as I'm even getting 4G speeds. UK Customers service was excellent when porting my number over to them. Thanks. Asda is a name familiar to most of us, and the supermarket does offer its own pay as you go mobile services. However, Asda is a piggyback carrier, meaning that though they offer their own contracts, they use EE’s mobile network to provide service. 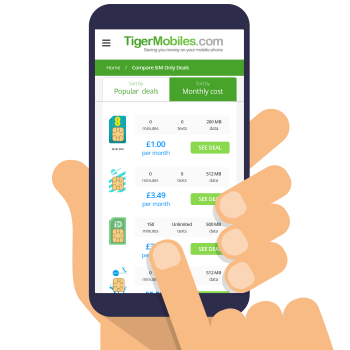 Asda Mobile are a low-cost network, meaning they could be a good deal if you’re not a big phone user. Because Asda Mobile use EE’s network to get service, you’ll have the same excellent coverage as EE customers get. Currently, EE (and therefore Asda) have a whopping 99% coverage for 2G and 3G signals, and an impressive 90% coverage for 4G. This should result in excellent reception no matter where you are. However, it’s always a good idea to check your local area using Asda Mobile’s coverage checker found on their home page. Unlike many big networks, Asda does not offer traditional phone or sim only contracts. All of Asda’s services are offered on a pay as you go basis. This means that you’ll pay for services before you use them, so you can’t get any unexpected bills. The flipside of this is that for very big phone users, pay as you go prices are generally higher than contract prices, in which case, Asda might not be the network for you. You can order a bundle whenever you like, though credit does expire after 30 days. In addition, Asda also offers a £5 Talk and Text bundle (250 minutes and 2000 texts) if you don’t need data, as well as data, add on bundles for extra data (500 MB of data for £5, 1 GB for £7.50, 4 GB for £12.50, 6 GB for £15). 30-day bundles expire after 30 days, as you would expect. However, traditional PAYG credit does not expire with Asda at all. You will need to use your SIM card at least once every 180 days (by calling or sending a text or accessing the internet) to keep your card active, however. As a low-cost network, Asda Mobile really doesn’t offer much in the way of extras and features. Roaming is covered inside the EU, but not anywhere else. And since there are no contracts, there’s no data rollover. When compared to other networks, Asda generally comes out as one of the cheapest options around for low users. Their £5 30-day bundle is a bargain compared to other operators, and their £10 bundle (600 minutes, unlimited texts, 3 GB of data) is beaten only by GiffGaff’s £10 bundle (which offers unlimited minutes, rather than just 600). As a general rule, GiffGaff offers slightly better deals, though not by much, but other than that, Asda is a great, budget-friendly choice. Asda Mobile is a SIM only operator, which means you will need your own phone when signing up for service. Since there are no contracts you won’t be able to get a contract handset. You’ll need an unlocked mobile phone, and Asda will supply you with a free SIM card. Unfortunately, Asda Mobile does not offer WiFi calling, though with 99% mobile coverage this shouldn’t be an issue,since you should have good regular reception nearly everywhere. Asda Mobile also do not offer free access to WiFi hotspots, as some other operators do, so you’ll need to depend on your own WiFi, mobile data, or WiFi from cafes and restaurants. Finally, Asda Mobile does allow mobile tethering, which is relatively unusual for a low-cost network. If you want to use your mobile data to get another device such as a tablet online, then you’re free to do so. If you’re a light phone user and you’re looking for a simple, pay as you go plan, then Asda Mobile is a solid choice. If you’re a heavier user, however, you’ll probably be better off looking elsewhere. And if you’re looking for perks, extras, or special features, then you’ll definitely want to look at other operators.